Misconduct in classroom is a common concern that teachers have to deal with in their work. When the peace in the classroom is threatened, also the students suffer. By using the correct methods teacher can create an atmosphere where it is pleasant for everybody to work. This book presents an operations model that is based on good teaching, respect towards the students and leadership. The book brings up also the perspective which sees the teacher as the origins of problems in the classroom. The third edition of this popular book takes into account also the changes made to the legislation that regulates the peace in the classroom. 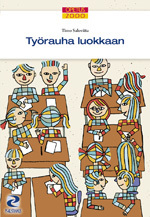 This book with its advices will be a great help to teachers in kindergartens as well as to the adult education. New teachers can consider this book as a survival kit that will be useful during their whole career. Teachers with experience will get new stimulus to develop their methods and practice.